The AU Screamin’ Eagles Pep Band was founded in 1930, and today it remains a popular way for musicians at the university to combine their school spirit with their love of performing. 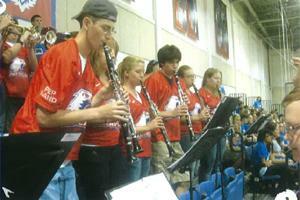 The band plays at all home volleyball and men’s basketball games, as well as all Phil Bender events on campus. They also participate in community events when possible, most notably the Marine Corps Marathon. They can be found at games and events sporting their uniforms of red football jerseys with their name and graduation year on the back. What makes the band unique from many other student groups on campus is that you’ll find among the group several alumni who have remained involved for years after graduation. AU Senior and Screamin’ Eagles president Andrea Duarte enjoys that alumni remain involved. “It is rare and cool that alumni participate in the Screamin’ Eagles. There aren’t too many student groups on campus where the alumni play such a large role in the group,” says Duarte. Pep Band alumni who wish to reconnect and get involved in band activities may email Andrea Duarte, CAS/BA ’13, at aupepband@gmail.com.